We are registered medical clinics offering excellence in skincare across two locations in West and North Yorkshire. Our first clinic, Good Skin Days Leeds-Bradford, based in Guiseley, was set up in early 2009, with the aim of providing an exceptional standard of care to patients requiring skin surgery and cosmetic skin laser treatments. In summer 2018 we opened our second clinic, Good Skin Days Harrogate. This traditional stone building was completely refurbished to our specifications. It features boutique consultation rooms and a fully-equipped Minor Operations Suite. 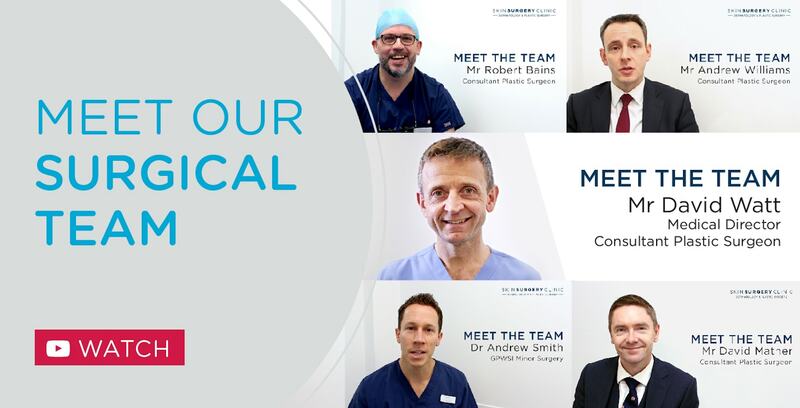 Mr David Watt, Consultant Plastic Surgeon and the Medical Director of Good Skin Days, leads our team of highly experienced Consultants, Doctors, Nurses and Practitioners, so you can be sure that you are in safe hands from the moment that you step into the clinic. Read the biographies of our medical team by clicking here. So that we can confidently call ourselves a ‘registered and regulated medical facility’, both of our clinics regularly undertake stringent and rigorous evaluation by the Care Quality Commission, our governing body. At our latest inspection we fully met all the expected standards – you can read the full inspection report here. Our aim is to be your first choice for all cosmetic and skin surgery treatments and we must therefore ensure that we have the newest and most effective technology at our fingertips. Good Skin Days now have thirteen CLASS FOUR medical grade lasers – the gold standard for laser skin treatments. Clinically proven to be effective, we consistently achieve fantastic results for our patients. Take a look at our Before & After gallery to see some of the results that we have achieved, or feel free to read through the testimonials that our clients have taken the time to write for us. These state of the art facilities, our highly experienced staff and the latest technology might come at extra cost to us, but we always offer our patients a GUARANTEED PRICE MATCH on all of our treatments. If you find a ‘like for like’ offer, just tell us and we will be happy to match it! Our most popular non-surgical treatments include Laser Hair Removal, Dermal Fillers, Laser Mole Removal, Anti-Wrinkle Injections and Clear + Brilliant® as well as surgical treatments including Surgical Mole Removal and Surgical Wart / Verruca Removal. We also have experts on hand, including a Consultant Dermatologist and a Specialist GP to discuss more complex skin conditions, such as Rosacea, Acne, Facial Red Veins and Leg Thread Veins. We are able to offer consultations with our Consultants and Doctors for the review and removal of moles and can arrange the histology of moles for your peace of mind. We can also offer Mole Checks, Skin Cancer Screening and Private Skin Cancer Treatment, should you need these services. You will find our friendly and knowledgeable team more than happy to answer any questions that you might have, so please do not hesitate to call or email us today.